We offer high quality service at low prices for budget travellers. 'Run by travellers for travellers'. The entire hostel was completely renovated inside and out in November 2013. we put in new bathrooms, new beds (with an individual reading light and electrical outlet), new furniture, new floors and new decorations. we also installed new doors which close without making any noise, with electronic card locks for added security. 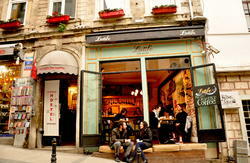 Metropolis Hostel is located in the historical old city of Istanbul. It's just a few mins from the Blue Mosque, St. Sophia, Topkapi Palace, Underground Cistern and Historical Turkish Baths... just 10 mins to Grand Bazaar and Spice (Eqyptian) Bazaar... just 30 mins to Taksim... and just 20 mins to Asian side by historical boat. Choose your bed from four bed or six bed mixed dorms, 6 bed female dorms, or double rooms with shared bathroom or ensuite. all rooms + dorms have air conditioning and most rooms have stunning views of the Marmara Sea, the Bosphorous, Prince's Islands and the Asian shore. All rooms have comfy mattreses including dorm beds. 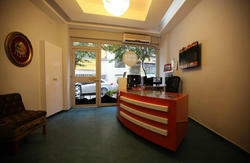 Our hostel is very secure with 24 hour reception and a safe box in which you may store your valuables. Very clean and great showers with 24 hour running hot water. You can meet people from all around the world in our common areas. 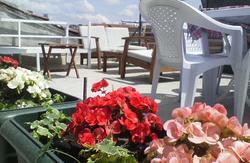 We have one covered common room as well as a roof top terrace area, both of which have great views of the Marmara sea, Blue Mosque, St. Sophia...you can eat your free breakfast on this great terrace. We also serve lunch, dinner and BBQ. Each week we host a BBQ party on our rooftop terrace, followed by a pub crawl to Taksim (the centre of nightlife and live music in Istanbul). 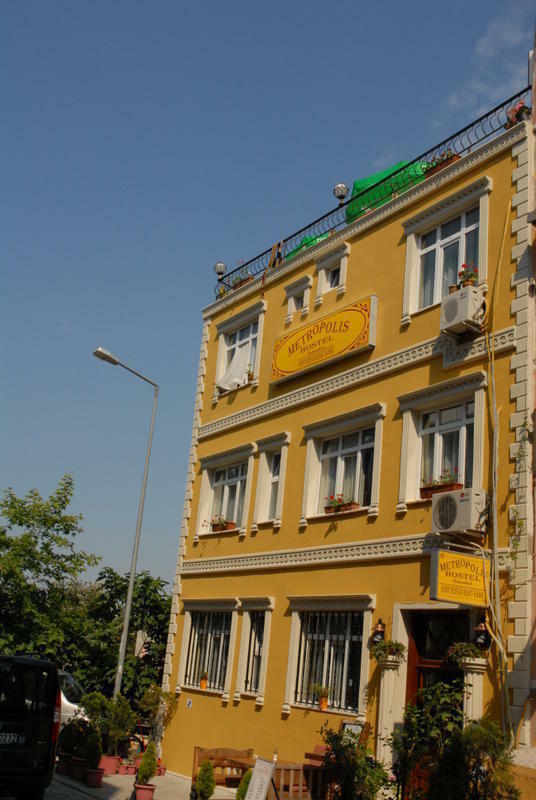 You can try traditional and very tasty Turkish food at our famous associated Metropolis Restaurant (which is just 20 metres from our hostel and on the very busy and popular backpacker street). We have several computers and free internet for our guests and also wireless internet connection throughout the hostel. So, you can connect to the internet with your own notebook. We have a big screen television to watch cable tv to keep in touch with the world, watch movie channels, sports events or you may ask for a movie from our rich DVD collection. Our travel agency can arrange all your travel needs with international-domestic flights, special city tours, dinner cruise by night, ANZAC tours (Troy & Gallipolli), Cappadocia, Ephesus, Pamukkale tours, belly dancing show with dinner (Turkish night) and Turkish bath. Please note: We welcome travelers of all ages. We ask, however, that travelers over 40 years old can book only into private rooms, and not shared dorm rooms. Our English, French, German and Spanish speaking staff will take care of you to make your stay even better. Please notify the hostel at least 72 hours in advance of your check-in date if you need to cancel your booking. Cancellations made after 72 hours will result in a charge to your credit card equal to your first night's stay. Travelers who cancel after their check-in date will be charged for the full length of their reserved stay. All cancellations, regardless of timing, will result in a loss of original deposit. All group cancellations must be reported to Metropolis Hostel at least 14 days in advance of your group's check-in date. Cancellations made 7-14 days prior to check-in will result in a charge to your credit card equal to your first night's stay. After 7 days, you will be charged for the full length of your group's reserved stay. All cancellations, regardless of timing, will result in a loss of original deposit. PS: Please print our google map and note the address before you leave. We have pick up service from Ataturk Airport for 25 euros (up to 4 people),35 euros ( up to 6 people), and for larger groups transfer please contact us. PS: Please send us your flight details if you would like to have this service. You can take tram just infront of station to Sultanahmet ( just 2 stops) and follow your map to reach the hostel. PS: Subway and Trams stop at 24:00. By Havas Bus and subway connection your journey may take aprox two hours. We have pick up service from Sabiha Gokcen Airport for 60 euros (up to 4 people), 70 euros ( up to 6 people), and for larger groups transfer please contact us.